One of my leadership principles is to create a healthy organizational culture. I think the best way to convey the message is to cultivate cooperation from people instead of enforcing compliance. I firmly believe that the management of any organization needs to document its rules and regulations; it’s formal expectations, if you will. For a lot of practical reasons, these documents need to be in place. The least reason will be as a reference, but it may be needed in a court case. The problem with a rule book is that it is the tool a weak manager uses to catch people doing something wrong. So, by default the rule is enforced after the rule is broken and damage has been incurred. Now the leader’s time is focused on policing employees and dealing with the administrative headaches with enforcement, documentation, counselling, and punishment (if needed). The deceptive problem with compliance is that it is, on the surface, easier. The rules are laid out and in black and white. Infractions will be punished! The downside is that now every encounter will be confrontational. The two parties will never engage in a meaningful communication because every conversation will escalate. The benefits of proactive actions are hard to measure. A person can measure the time they spend in correcting behaviors, but you can’t measure the time you saved by avoiding potential problems. Riffing off of the old science saying that you can’t prove a negative, in this case “you can’t prove the positive”. It can be analogous to wearing a seatbelt: we can’t predict in every instance that a seatbelt will prevent death or injury, but that is the best way to bet. There is a time investment though. As a good leader, you have to be in and among your people, engaging them and showing that you care. You have to make that upfront investment in time to prevent problems. The unforgivable mistakes are dispassionately and quickly resolved. Cooperation is more complex, but has greater long-term benefits. You need to lay down the foundation of open communication and trust. Discussions are the default mode when even situations are negative. If they are potentially confrontational, it will be exception to the experiences of both parties. A path of de-escalation is available since everyone has had the experience to discuss even difficult subjects without arguing. Invest in your people, show that you trust them and treat them as adults. Communicate your expectations and listen to their concerns. Don’t be an enforcer. As an enforcer, every encounter will be negative by definition of role. For the last 20 years, I have started every corrective counselling session with the phrase “I did not hire you so you would fail”. Their individual success in the workplace is my motivation. Foster that atmosphere of cooperation as a part of your healthy organizational culture. 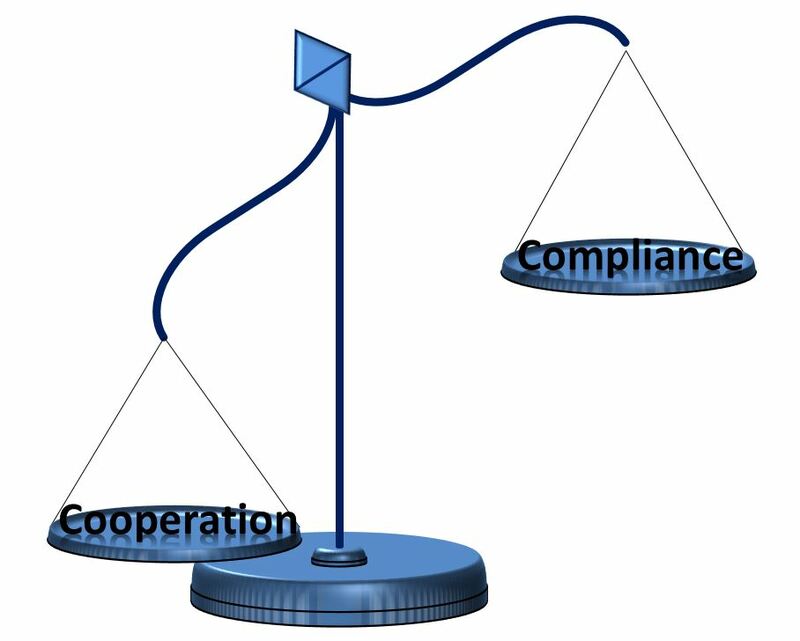 Enforcing compliance is a constant drain on the time and motivation of everyone. Compliance can seem straight forward, but it gives you the least return on your time investment. I think you catch my meaning there. I stole this from “The One Minute Manager” by Blanchard and Johnson. ← Why are We Assessing Leadership Roles and Styles?